Dr. Kaur and her staff were very pleasant, friendly, and comfortable to talk with. They all were helpful and detailedin their explanation of my diagnosis and my treatment plans, including details of the coverage of my dental plan. THANK YOU! Dr. Kaur and her staff were very pleasant, friendly, and comfortable to talk with. They all were helpful and detailed in their explanation of my diagnosis and my treatment plans,including details of the coverage of my dental plan. THANK YOU! This was the best experience I have ever had with a dentist. Everyone in the office was extremely nice and allwork was done gently. Everything was explained and a treatment plan including the total cost and what was covered by insurance was emailed to me a short time after the appointment. This was the best experience I have ever had with a dentist. Everyone in the office was extremely nice and all work was done gently. Everything was explained and a treatmentplan including the total cost and what was covered by insurance was emailed to me a short time after the appointment. Current special: Home teeth whitening for life ( only eligible if no decay, no sensitivity, no gum disease and while a patient of the practice). Offer ends June 30th. 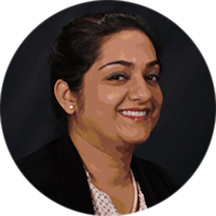 Dentistry is not just a profession for Dr. Kaur, it is a passion that she has pursued her entire life. She is ever keen to learn new techniques and investigate new products that promise to improve the oral and dental wellness and overall health of her patients. Dr. Kaur received her Bachelor of Dental Surgery at NITTE Education Trust A.B. Shetty Memorial Institute of Dental Sciences (affiliated to the Rajiv Gandhi University of Health Sciences in India). She then she did her residency as a General Dentist at MAMC, New Delhi. Upon finishing her residency she worked as a General Dentist in New Delhi. In 1999 she joined the prestigious Boston University Goldman School of Dental Medicine and started the advanced standing program. She graduated from the advanced standing program with a DMD in 2001. Upon graduation, she acquired a practice in Frederick, MD, and later joined up with Esthetique Dentistry. Prompt service, friendly and knowledgeable staff, very clean office, pleasant experience.